Peter Cook and Franck Pelle won Sunday’s three-hour Britcar race in their Porsche 911 GT2, re-taking the lead in the closing stages from the Leslie / Handkammer BMW M3. The grid set by Saturday’s sprint race, had a few gaps owing to breakdowns and withdrawals, and as the race got under way, Mick Mercer exploited the extra space, and the Topcats Marcos Mantis was up to third, behind Sharpe’s Falcon and Handkammer’s BMW, as the pack approached Riches. Steve Hall, in Nigel Mustill’s Opel V8Star, was moving swiftly through the middle order, and, with Peter Cook’s Porsche 911, was challenging Handkammer, who had slipped to fifth, and with half an hour gone, Chamberlain had a 12-second lead over Sharpe’s Falcon, with Lockie’s third place in jeopardy from Peter Cook’s advancing Porsche. Handkammer’s BMW had settled in fifth, maintaining a comfort zone in front of Hall. But motor racing isn’t always about drama – sometimes there is comedy too. 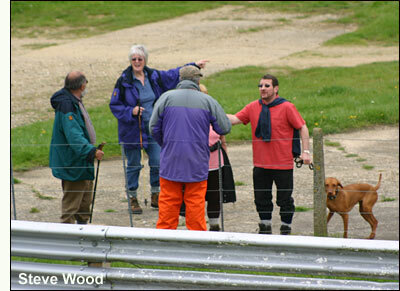 A group of ramblers – and their dog - had emerged from the bushes opposite the start-finish line, and wandered interestedly up to the spectator fence. A brief word with a concerned marshal, and they were on their way, waving to a chuckling Brian Jones in the commentary box. 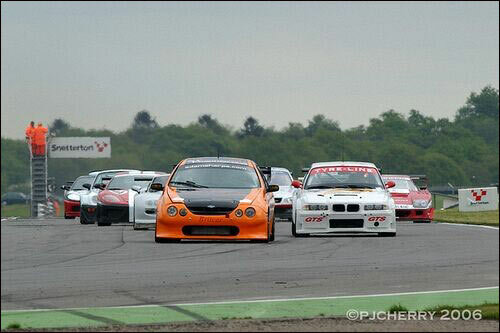 So, there is a way of getting into Snetterton for free, it seems. There was a spate of mandatory pit stops around the one-hour mark – one-third distance – which saw Handkammer stay out, and inherit the lead. Twenty minutes later, once David Leslie had taken over the GTS Motorsport BMW M3, Franck Pelle was top of the leaderboard, the big white 911 now holding half a minute sway over George Haynes in the Falcon. Leslie was third, with Bo McCormick’s Ferrari steady in fourth, in front of Luc Paillard, who had relieved Mercer in the Topcats Marcos. 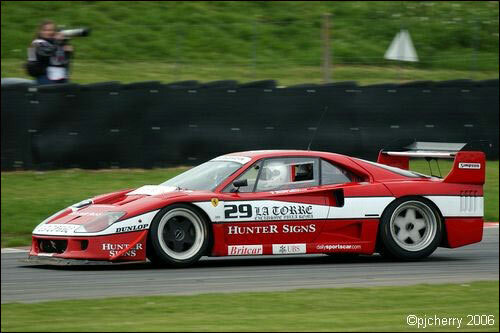 There were further woes for the Ferrari F40, Jacopo Sebastiani cruising past the pits, and parking alongside the pit exit, the gearbox broken. With 90 minutes chalked up, there was a scare for Haynes, the Falcon leaving a trail of rubber smoke as its right rear tyre rubbed on the wheel arch. A stop to change the wheel, and a fuel opportunity, saw Haynes drop to fifth, and, once Pelle stopped a few laps later (but not handing over to Cook), Leslie took the lead once more. So, with the final hour looming, there was another round of mandatory stops; Allen handed the Porsche back to Chamberlain, Barry Horne to Bill Cameron (the pair having a relatively low-key day in the Team Parker Porsche), Haynes to Sharpe, and Bo McCormick to Calum Lockie. 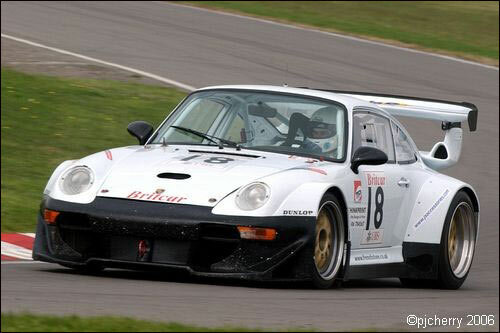 David Leslie, however, double-stinted into the final hour, and, as the race ran down into the final 30 minutes, held a 14-second lead over Peter Cook, who had taken over the white 911 from Pelle for the final 45 minutes. Lockie had already taken Hyperion boss Richard Fores, in the #6 Topcats Mantis, for third, and had been followed through by Sharpe’s Falcon, and Steve Hall in the OpelV8 Star. Chamberlain pitted, this time for good, with gear selection problems on the 935 replica. Would this go down to the wire? As the clock ticked down, so did the gap between Leslie and Cook – 7.4, 6.6, 4.5 on consecutive laps, and with just five minutes to go, Leslie was powerless to resist the Porsche, leaving Cook to take the flag five and a half seconds to the good, completing 145 laps. Lockie brought the Hargreaves Ferrari home a lonely third, and, despite a quick fuel stop in the closing minutes, the ASM Falcon retained its fourth place. 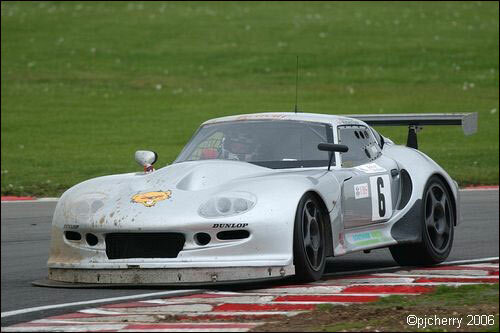 Fifth, and third in the GTRS class, was the Nigel Mustill’s Opel V8Star, after some rapid lapping in the hands of Steve Hall, and the Cameron / Horne Porsche GT3 was sixth. No dramas this time for the young Cole brothers, Craig and Elliott finishing seventh in the Damax Ferrari 360, and the Mercer / Paillard / Fores Mantis was eighth. 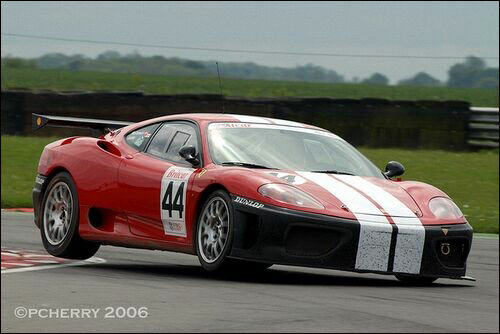 The black Damax Ferrari 360 of David Back, David Foster and Andy Ruhan finished a steady ninth, and East Anglian businessmen Kevin Hancock, Leigh Smart and Nigel Rata enjoyed their run in the Jemco Marcos to tenth. 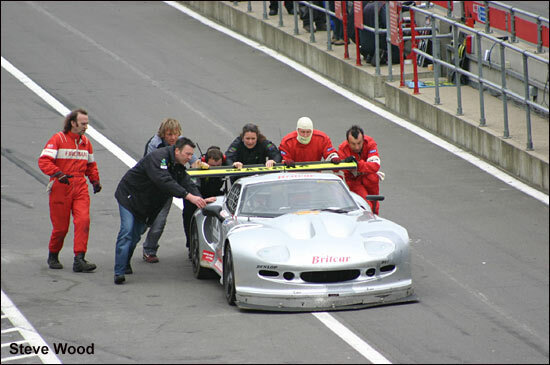 Jo Harrison and Paul White were the last classified finishers in eleventh, their Topcats Marcos suffering a dragging splitter for much of the race, and needing a push start after a mid-race pit stop. Spa is the next EERC event, where the Britcar and ProductionS1 runners combine for a four-hour evening race, on June 3rd.